Most modern interpreters believe the ‘gift of God’ is ‘salvation by grace through faith’. Ancient exegetes said that it was the faith itself. Ephesians 2:8-10 is well-known as Paul’s doctrine of salvation in miniature. Reformed Evangelicals love this passage, using it to explain what sits at the heart of the gospel—the relationship between grace, faith, and works in salvation. J C Ryle was converted simply by hearing it read in church. It’s a key passage in the popular Just For Starters: Seven Basic Bible Studies. Many of us have put together the puzzle of ‘grace’, ‘faith’ and ‘works’ from Ephesians 2:8-10. The paradigm ‘Not Saved By Works But For Works’ is a vital component of the excellent ‘Christianity Explained’ course, and rests on this passage. Indeed, the current de-emphasis on this in some circles blunts the cutting edge of the gospel. I grew up Roman Catholic, wondering how I could be good enough for God. Then at university an MTS worker did Just For Starters with me. We opened the Bible, and in that hut at Kensington, I got God’s grace. I realised that my acceptance before God at the judgement is not based on my goodness or moral effort, but on God’s goodness and Jesus’ moral effort. I discovered that I’m saved, not by good works, but for good works. God even gave me the faith that joins me up to Jesus. God predestined the good works that he has now given me to do. However, I came to discover with surprise and disappointment that many didn’t understand these verses ‘my’ way. Reading commentaries and learning Greek revealed that—in technical language—the demonstrative translated ‘this’ (v8) is neuter, but the noun for ‘faith’ is ‘feminine’. For my naive view to stand, they should agree—but they don’t. My Greek textbook declared, ‘On a grammatical level, then, it is doubtful that either “faith” or “grace” is the antecedent of [touto].’ Was this the death knell to my beloved understanding of Ephesians 2:8-10? Further reflection yielded other questions. For example, verse 9 doesn’t say ‘good works’ but ‘works’—the adjective ‘good’ is only found in verse 10. So are ‘works’ (v9) the same as ‘good works’ (v10)? Are the works we are saved for different from those we are not saved by? Many say ‘yes’. Some limit the non-saving ‘works’ to ‘pre-baptismal’ ones, but then say that ‘post-baptismal’ works actually do save us. Or does verse 9 merely exclude from saving efficacy ‘ceremonial works’ or ‘Jewish boundary markers’? So are we saved by ‘good works’ after all? Furthermore, in Ephesians, Paul doesn’t use the ‘justify’ words at all—although Protestants often assume it does. Is it a sound assumption? And what about the relationship between ‘not from yourselves’ (v8) and ‘not from works’ (v9)? What could it mean to say that ‘faith’ is ‘not from works’? And is it true to say that God has predestined our specific and individual ‘good works’? After all, the divine pre-preparation may simply have been God commanding them. I don’t want to imply that I experienced some terrible existential crisis. I knew that other passages taught that our believing response to God is enabled by God if this one didn’t (see e.g. Acts 5:31, 11:18, 13:48, 16:14). But that didn’t mean I was eager to surrender a reading that had been so important to my early faith. And now I believe that there are good reasons to think that my naive understanding was right after all. First, Classical Greek literature, the Septuagint, and the New Testament, provide evidence that ‘this’ can indeed refer to ‘faith’. There are 15 certain or highly probable examples of this rule—ten in the classical literaturę, four in the Septuagint, and one in the Greek New Testament. I can confirm Kuyper’s assertion. 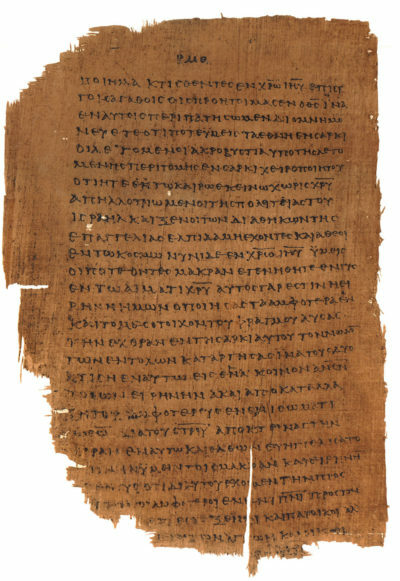 Only a minority of ancient commentators associate ‘this’ exclusively with salvation, eight ancient exegetes specifically assert that ‘this’ refers back to a feminine noun in Ephesians 2:8-9, seven taking touto to refer to ‘faith’ (Chrysostom, Jerome, Augustine, Theodoret, Fulgentius, Œcumenius, Theophylact), and one taking it to refer to ‘grace’ (John of Damascus). These interpreters were either native Greek speakers or, in the case of Jerome and Fulgentius, Latin speakers of undoubted Greek ability, or, in the case of Augustine, the greatest extant theologian of the first Millennium.This is doubly important because the ancient Greek-speaking exegetes themselves were inclined to see faith as a human work. They thought human free-will had a controlling place in salvation, and that predestination was simply God foreseeing human virtue. Their exegetical decisions thus were generally in spite of, rather than because of, their theological commitments.In contrast with the ancients, most modern interpreters believe the ‘gift of God’ is the concept ‘salvation by grace through faith’. This is quite acceptable in terms of grammar. Calvin adopted it, and is followed by ‘the great majority of modern commentators’. Only three ‘modern’ commentators agree with the incumbent ancient understanding, and they all died last century! However, 19th century Greek grammars, steeped in the Classical literature from which Koinē Greek developed, articulate the rule that a neuter demonstrative can refer back to a masculine or feminine word. Modern commentators sometimes acknowledge this. The trajectory of verses 1-7 is not that humans under sin are sick and impaired but dead and enslaved. We were ‘dead’ in our ‘transgressions and sins’ (v1), and Paul includes himself with us in that plight (v5). Every human at one time has walked according to the world, the flesh, and the devil (vv2-3), and this requires that God must make us alive in Christ (v5) if we are to exercise faith (v8). The clause ‘by grace you are saved’ explains ‘he made us alive with Christ Jesus’ (v5). So ‘making alive’ is part of God’s salvation by grace. ‘By grace you are saved’ appears again (v8), but a new, human element is introduced—‘through faith.’ This makes it more likely that the new element, ‘faith’, is the subject of verse 9. That is, Paul has already explained that clause (vv5-7). But the new element, ‘through faith’ (v8) most needed the explanation of verses 8-9. Lest his readers think faith is some independent action on the part of the subject, the Apostle puts it more starkly—‘faith’ is in one sense ‘not from ourselves’, though from another perspective, ‘faith’ is obviously from ourselves. And if ‘faith’ is the gift of God, so too is ‘grace’ and ‘salvation’. It cannot be otherwise. As Œcumenius said, ‘for us to believe [is the] gift of God, and to be saved through faith [is the] gift of God’. It is not ‘either/or’ but ‘both/and’. The Eastern theological tradition considers that the divine cause of faith is adequately explained by God’s initiative-taking in the incarnation and gospel-preaching (Romans 10:14; Chrysostom; Œcumenius). This leaves room for free-will in the scheme of salvation, where grace is ‘fellow-worker’ (synergos) with free-will. It is synergistic. By contrast, mature Augustinianism holds that the impulse by which we seek God is itself given to us by God. ‘[W]e receive, without any merit of our own, that from which everything … has its beginning— that is, faith itself.’ Likewise, Fulgentiussays ‘and, since this faith is divinely enabled, it is without doubt bestowed by his free generosity’. It is not only the divine invitation to, but the divine enablement of, faith, that more accurately accords with faith being ‘the gift of God’. But even when we were created for good works, not only have we done nothing good, but we have even returned the very opposite […] But this, being created for good works, is at one and the same time both urging us forward to do [good deeds] and standing [us] apart from good deeds. ‘Standing us apart from good deeds’ can only be a reference to ‘not from works’ (v9). Photius thus equates ‘good deeds’ with ‘works’. Though we have been created for good works, we have done nothing good. Thus, Ephesians 2:8-10 teaches that we are not given saving faith by good works, but with the purpose that we do good works. The works that we are not saved by, these very same works we are saved for. ‘Good works are never the cause of salvation but ought to be its fruit’. Verse 10 also teaches that God has prepared beforehand these ‘good works’. The prefix pro— is used in Ephesians 1:4, 5, 9, 11 to connote a divine decree before the foundation of the world. Giving pro— the same meaning in Ephesians 2:10, means that God predestined and prepared the specific good works to those to whom he gives faith. The good works do not derive from the believer as they are planned and purposed by God, and therefore they cannot be said to merit salvation or faith. Unsurprisingly, the word translated ‘prepared beforehand’ also appears in Romans 9:23, in a context which suggests divine predestination. Interestingly, Paul doesn’t use ‘justification’ terminology at all in these verses. The closest we get to it is ‘seated with Christ’ in the heavenlies—clearly a positional category (v6). This is important, reminding us that ‘salvation’ is a broader idea that can encompass other teachings such as predestination, regeneration, sanctification, and rescue from punishment, whereas ‘to justify’ is a more limited forensic category meaning ‘to declare righteous’. The elderly Bishop Augustine effectively united the majority Eastern exegesis of Ephesians 2:8-10 with a theological underpinning that gave this exegesis its natural home. Augustine’s rejection of the near universal view of predestination according to foreseen virtue and embracing of absolute predestination made him the first thorough-going monergist. His soteriology was more consonant with the interpretation of Ephesians 2:8-9 found in the East. Regarding ‘faith’ as the ‘gift of God’ in Ephesians 2:8-9 has ample support to merit the label ‘catholic’, even if the mature Augustinian doctrine of predestination does not. Learning these things from both the Eastern and Western exegetical traditions concerning Ephesians 2:8-10 enables us to be ‘more Calvinistic than Calvin’, who thought it an error to say that ‘faith’ was the gift here. But it is quite acceptable according to the rules of Greek syntax. Our modern grammars and commentaries should be revised to reflect that reality. Theodoret of Cyrrhus (c. AD 393–c. AD 458/466), Letters 83, ‘To Dioscorus’, in Blomfield Jackson (trs), P Schaff and H Wace (eds), NPNF2 (Buffalo, NY: Christian Literature Publishing Co, 1892), 3:279; online at http://www.newadvent.org/fathe… accessed 3 September 2017; cited in N Needham, ‘Justification in the Early Church Fathers’, in B L McCormack (ed), Justification in Perspective: Historical Developments and Contemporary Challenges (Grand Rapids/Edinburgh: Baker/Rutherford House, 2006, 51. D B Wallace, Greek Grammar Beyond the Basics: An Exegetical Syntax of the New Testament (Grand Rapids: Zondervan, 1996), 334-5. For detailed discussion of the 15 examples and others see https://sites.google.com/site/mattolliffe/articles/is-faith-gods-gift-10–ephesians-28-9-the-grammatical-issues. Herodotus, The Histories, 3.82, 4.23; Plato, Protagoras, 352b, 357c; idem, Republic, 9.583e, idem, Theaetetus, 145d; Xenophon, Hiero, 9.9; Demosthenes, Against Aphobus for Phanos 3, Oration 29, idem, Orations 2: Olynthiac 2 , idem, Against Leptinesm, 20 . Genesis 2:22-23, 14:17; Isaiah 6:6-7; Ezekiel 16:49 (LXX). Wallace, op cit, 335 fn 56, regards Philippians 1:28 as the one ‘possible’ illustration, but Calvin, Comm Philippians, in Calvin Commentaries, 21:48, and G D Fee, Philippians: NICNT (Grand Rapids: Eerdmans, 1995), 170, rightly limit the reference in v28 to ‘salvation’, since the explanation in v 29 (note ‘for’) shows Paul’s focus is on ‘salvation to you’ rather than the earlier ‘sign of destruction for them’. See Marius Victorinus (c. AD 300–AD 370): Stephen Andrew Cooper, Marius Victorinus’ Commentary on Galatians (Oxford: OUP, 2005), 167-8; idem, Metaphysics and Morals in Marius Victorinus’ Commentary on the Letter to the Ephesians (New York: Peter Lang, 1995), 67; M J Edwards (trs), T C Oden (ed), Galatians, Ephesians, Philippians: ACCS (Downers Grove, IL: IVP, 2005), 126-7. For details see https://sites.google.com/site/mattolliffe/articles/is-faith-gods-gift-ephesians-28-9-marius-victorinus. Theophylact suggests it as a second option, Migne, PG, 124:1056B-1057A. Chrysostom (c. AD 349–AD 407), Homilies on Ephesians IV, in P Schaff (ed) NPNF1, 13:67-68, accessed at http://www.ccel.org/ccel/schaff/npnf113.iii.iv.v.html on 12 August 2016; Greek Text from J-P Migne (ed), Patrologia Graeca (Patrologiae Cursus Completus. Series Graeca Volume 62 S. Joannes Chrysostomus Vol 11 (Paris, 1862), Col 33-34, accessed at http://books.google.com/books?id=E_gbZgKru-QC on 12 August 2016. Cf. W A Jurgens (Ed and Trans), The Faith of the Early Fathers: Post-Nicene and Constantinopolitan eras (Collegeville: Liturgical, 1979), Vol 2:120. For detailed analysis see https://sites.google.com/site/mattolliffe/articles/is-faith-gods-gift-ephesians-28-9-chrysostom. Augustine (AD 354–AD 430), On the Predestination of the Saints, Book 1 Chapter 12 in P Schaff (ed), NPNF1, 5:504. For details see https://sites.google.com/site/mattolliffe/articles/is-faith-gods-gift-ephesians-28-9-augustine. on 13 August 2016; cf. W A Jurgens, The Faith of the Early Fathers: 3 Volumes (Collegeville: Liturgical, 1970-79), 3:248-9 sec 2163, cited in T Oden, The Justification Reader (Grand Rapids: Eerdmans, 2002), 44. For details see https://sites.google.com/site/mattolliffe/articles/is-faith-gods-gift-ephesians-28-9-theodoret. Fulgentius of Ruspe (c. AD 467–c. AD 532), On the Incarnation, 1, in Mark J Edwards (ed), Galatians, Ephesians, Philippians: Ancient Christian Commentary on Scripture, New Testament VI: (Downers Grove: InterVarsity Press, 1998), 133-134; also cited in Oden, Justification Reader, 48. For details see https://sites.google.com/site/mattolliffe/articles/is-fath-gods-gift-ephesians-28-9-fulgentius. Œcumenius of Trikka (c. AD 990): J–P Migne, Patrologia Graeca (Patrologiae Cursus Completus. Series Graeca) Vol 118, Oecumenius Vol 1: Commentary on Acts, Commentary on Paul’s letters, Commentary on the Catholic letters, 118:1192B-1193B at http://www.archive.org/details… accessed 1 October 2016;. Theophylact of Bulgaria (AD 1055–AD 1107) also gives a second interpretation: ‘Or [we can] also [take it] in another way: He is not saying [that] faith is the gift of God, but that to be saved through faith, this is the gift of God. For let us have it established that faith is our own: How could it [i.e. faith] alone be sufficient to save [us], unless God is pleased to receive us through it?’: Exegis eis tas praxeis ton apostolon kai eis tas epistolas tu Paulu. (Commentarius in apostolorum facta et epistolas Pauli. ): 5. 6; ‪ Biblia Graece: He Kaine Diatheke 5.6 Volume 1 of Exegis eis tas praxeis ton apostolon kai eis tas epistolas tu PIaulu: Triccae episcopus Oecumenius (Athens, 1844), 108 fn (1); Also J –P Migne, Patrologia Graeca (Patrologiae Cursus Completus. Series Graeca) Volume 124 Theophylact of Bulgaria Volume 2: Commentarius in Joannis Evangelium (contd. ); Commentary on Paul’s letters, retrieved from http://books.google.com/books?id=lzURAAAAYAAJ on 7 October 2016, Col 1056B-1057A. John of Damascus (AD 676-c. AD 754/787): J –P Migne, Patrologia Graeca (Patrologiae Cursus Completus. Series Graeca) Volume 95, ‘John Damascene’ volume 2: (various), Sacra Parallela, Col 829A-832A, retrieved from https://archive.org/details/pa… on 21 September 2016. For details see https://sites.google.com/site/mattolliffe/articles/is-faith-gods-gift-ephesians-28-9-john-of-damascus. Calvin, Comm Ephesians, in CC 21:228-9. E Best, Ephesians: ICC (London/New York: T & T Clark, 1998), 226. Marcus Barth, Ephesians 1–3: AB Vol 34 (Garden City: Doubleday, 1974), 225); G B Caird, Paul’s Letters from Prison: Ephesians, Philippians, Colossians, Philemon, in the Revised Standard Version (Oxford: OUP, 1976), 53); E K Simpson, ‘Commentary on the Epistle to the Ephesians’, in E K Simpson and F F Bruce, Commentary on the Epistles to the Ephesians and Colossians: NICNT (Grand Rapids: Marshall Morgan & Scott/Eerdmans, 1957/1975), 54-55. Raphael Kühner, Ausführliche Grammatik der Griechischen Sprache (Hanover: Hahn, 1870), Vol 2 Part 1 §361 p54; William Edward Jelf, A Grammar of the Greek Language Chiefly from the German of Raphael Kühner: Syntax (Oxford: John Henry Parker, 1842), p35 §381 Obs 2; Basil L Gildersleeve, Syntax of Classical Greek from Homer to Demosthenes (New York: American Book Company, 1900), 18.2.501. Augustine, On the Gift of Perseverance, 64, in Peter Holmes and Robert Ernest Wallis (trs), Benjamin B Warfield (rev), Philip Schaff (ed), NPNF1 Vol 5, (Buffalo, NY: Christian Literature Publishing Co, 1887), revised and edited for New Advent by Kevin Knight . Augustine, On the Grace of Christ and Original Sin, Book 1 Chapter 34 in P Holmes, R E Wallis (trs), B B Warfield (rev), P Schaff (ed), NPNF1 5:229-30 online at https://www.ccel.org/ccel/scha… and http://www.newadvent.org/fathe… accessed on 3 September 2017. Fulgentius, On the Incarnation, 1, in Mark J Edwards (ed), Galatians, Ephesians, Philippians: Ancient Christian Commentary on Scripture, New Testament VI: (Downers Grove: InterVarsity Press, 1998), 133-134; also cited in Oden, Justification Reader, 48. E.g. Chrysostom, Homilies on Ephesians IV; Migne, PG, 62:33-34. On Grace and Free Will, chapter 17, in NPNF1, 5:450-1 online at https://www.ccel.org/ccel/scha… and http://www.newadvent.org/fathe…, accessed on 3 September 2017. John M G Barclay, Paul & the Gift (Grand Rapids/Cambridge: Eerdmans, 2015), 571. Other aspects of Barclay’s thesis, such as asserting that Ephesians was not written by Paul, or regarding it as a decline from Paul’s teaching on salvation, are open to criticism. As quoted by Œcumenius: Migne, PG, 118:1192B-1193B online at http://www.archive.org/details… accessed 1 October 2016. Perhaps we see here the seeds of the Reformation’s simul iustus et peccator. E Best, Ephesians: ICC (London/New York: T & T Clark, 1998), 231. Vincent of Lérins (d. between AD 434-450) obliquely criticized Augustinianism as heresy and as having failed his test of catholicity: Commonitory: For the Antiquity and Universality of the Catholic Faith Against the Profane Novelties of All Heresies, Chapter 26, in C A Heurtley (trs), Philip Schaff and Henry Wace (eds), NPNF2 Vol 11 (Buffalo, NY: Christian Literature Publishing Co, 1894), revised and edited for New Advent by Kevin Knight http://www.newadvent.org/fathe…; J Ghellinck, ‘St Vincent of Lérins’ in The Catholic Encyclopedia Vol 15 (New York: Robert Appleton Company, 1912), retrieved 25 June 2017 from New Advent: http://www.newadvent.org/cathe….